The Cyclic Catastrophism scenario involved one hundred 14.4-year encounters of Mars with the Earth between 3700 and 687 BC. These are recorded in a number of places on both planets in the form of sedimentary deposits. What is most impressive, and least discussed by planetary scientists or their geologlist counterparts, are ‘rythmic’ formations with as many as one hundred layers of nearly equal thickness and similar weathering. Figure 1 is a NASA HIRISE image of rock layers in the crater Becquerel on Mars. 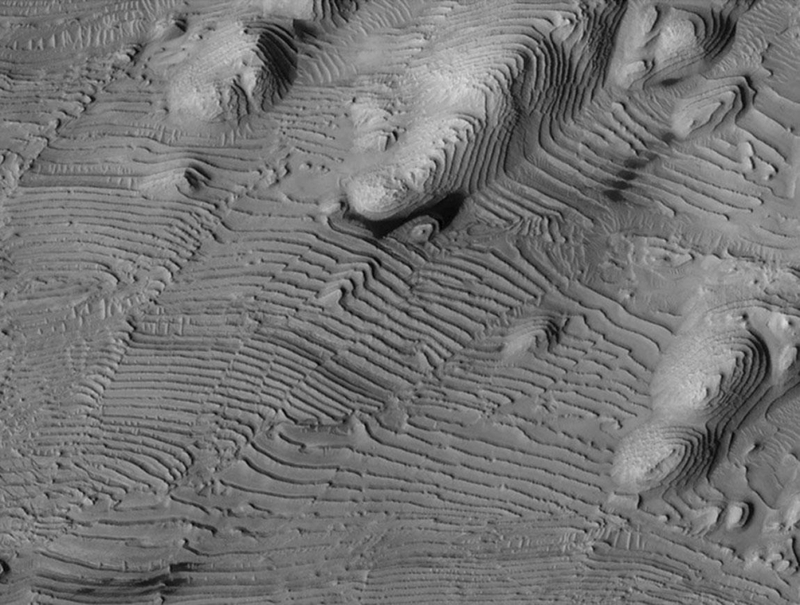 These layers are currently imagined to be the result of ‘Milankovich cycles’ – cyclic changes in Mars axial tilt (obliquity) with respect to the plane of the solar system, calculated to have a period of 124,000 earth years. This time span between layers is comparable to the phenomenon thought to have caused the ice ages on Earth. 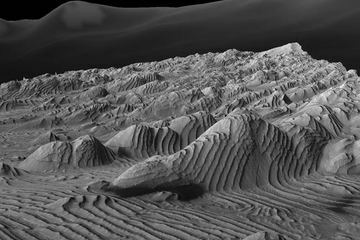 Thus scientists are hypothesizing that that each layer shown in the Becquerel crater in Figure 1 corresponded to an entire ice age on the Earth in spite of the global dust storms we observe every few years on the Red Planet. An added irony is that neither the Earth or Mars has experenced more than 6,000 years of these calculated obliquity cycles. Figure 2. gives another view of the Becquerel crater deposits, emphasizing their mysterious groupings of roughly ten. These are sedimentary rocks, not sand dunes, as evidenced by faulting. beyond ironic, because the maria on the near side of the Moon were actually created by a rapid-fire sequence of fourteen bodies ejected from Mars (the legend of Isis and Osiris) as it orbited the Earth less than 3,000 years ago. Therefore the dates of the material sampled in the maria are merely indicative of the age of Mars. 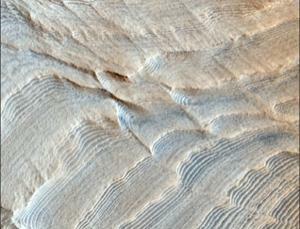 Similar layering is present in Danielson crater on Mars (Figure 3). During the same period of cyclic catastrophism enormous changes took place on the Earth, due to the proximity of Mars in its geostationary orbit above Mt. Kailash in the Transhimalayas. This tidal locking of the two planets forced the spin axis of the outer shell of the Earth to Hudson Bay for 14.4 years at a time – a total of one hundered encounters. The great continental glacier now called the Laurentine Ice Sheet, would thicken for 14.4 years and then melt for the next15.6 years when Mars was released into its planetary orbit for 15.6 years. This cycle of accumulation and melting shows up in the Missoula River Valley as the Toucet Beds. The dating for Waitt’s proposed separation of layers into sequential floods has been supported by subsequent paleomagnetism studies, which supports a 30–40 year interval between depositions of Mount St. Helens’ ash, and hence flood events, but do not preclude an up to 60 year interval. 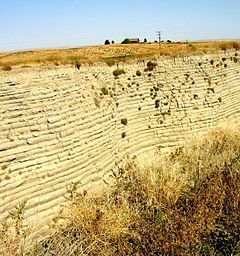 Offshore deposits on the bed of the Pacific at the mouth of the Columbia River include 120 meters of material deposited over a several thousand year period that corresponds to the period of multiple scabland floods seen in the Touchet Beds. Also, in conflict with current geological opinion, Cyclic Catastrophism explains that the Laurentine Ice sheet did not form at the time of the ‘Ice Age’, in the Pleistocene, but between 3700 and 687 BC, well into the Neocene Era. In researching the Columbia River flooding on the internet, I came across the following amazing paragraphs at http://www.nps.gov/iceagefloods/h.htm. If only these unnamed scientists from NASA and JPL could take the leap of faith out of their little uniformitarian envelope, Cyclic Catastrophism can answer all their questions about the solar system. 1 Clague, John J.; Barendregt, Rene, Enkin, Randolph J. and Franklin F. Foit, Jr. (March 2003). “Paleomagnetic and tephra evidence for tens of Missoula floods in southern Washington”. Geology (The Geological Society of America) 31 (3): 247–250. Bibcode:2003Geo….31..247C. doi:10.1130/0091-7613(2003)031<0247:PATEFT>2.0.CO;2. ~ by Angiras on April 7, 2014. Steve Smith of Thunderbolts made a similar presentation at the recent TB conference, showing these distinct, repetitive layers of stone. We were given 3D glasses which made the viewing on the big screen rather impressive. Rather than establishing ancient water erosion, the EU theory is that this was due to electrical machining during close planetary encounters. Interesting that you don’t follow this convention, yet are ‘out of the box’ in regards to Mars’ history.